Fluffy and flavorful Cranberry Orange Pancakes are topped with Maple Cranberry Syrup! Homemade pancakes are one of my favorite things in life. So I was shocked to see that the last time I shared them with you was over 9 months ago! And I think we can all agree that 9 months without pancakes isn’t just wrong… it’s a tragedy! But I’m about to make it up to you. And BIG TIME! 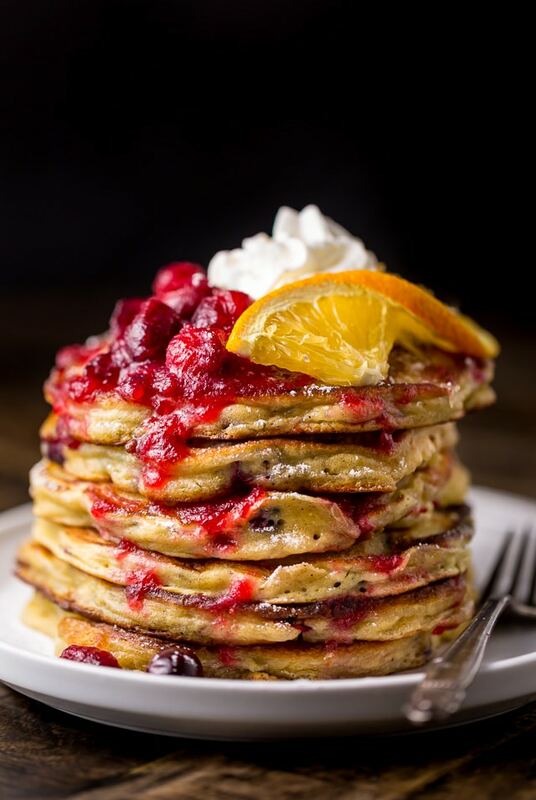 Because I made you the most delicious cranberry orange pancakes ever! And to sweeten the deal, I topped them with homemade cranberry maple syrup. First of all, let’s talk about cranberries! Because they really are the star of this recipe. Since I know fresh cranberries aren’t always easy to find, I tested this recipe with fresh and frozen, and I’m happy to report both work wonderfully! But I don’t suggest using dried cranberries. Because cranberries can be tricky to chop by hand, I suggest pulsing them in a blender of food processor. Just a few seconds should do the trick! The batter for these pancakes is very thick, but don’t fret – once it hits the hot pan it puffs up and transforms into fluffy pancakes! Promise. Because the batter is so thick, I suggest cooking these pancakes on low to medium-low heat. That way they can cook all the way through without burning. You can use oil or butter to grease your griddle/pan. I love butter because of the flavor it adds, but it does “brown” quicker than oil. My little secret for keeping cooked pancakes warm while I make the rest of the batter is to preheat the oven to lowest setting and place a large baking sheet inside. As the pancakes are cooked, I transfer them onto the baking sheet. Be sure to use a potholder when removing the pan as it will be very hot! This recipe is freezer friendly! All of my tips on how to freeze – and reheat – these pancakes can be found in the “notes” section of the recipe box below. 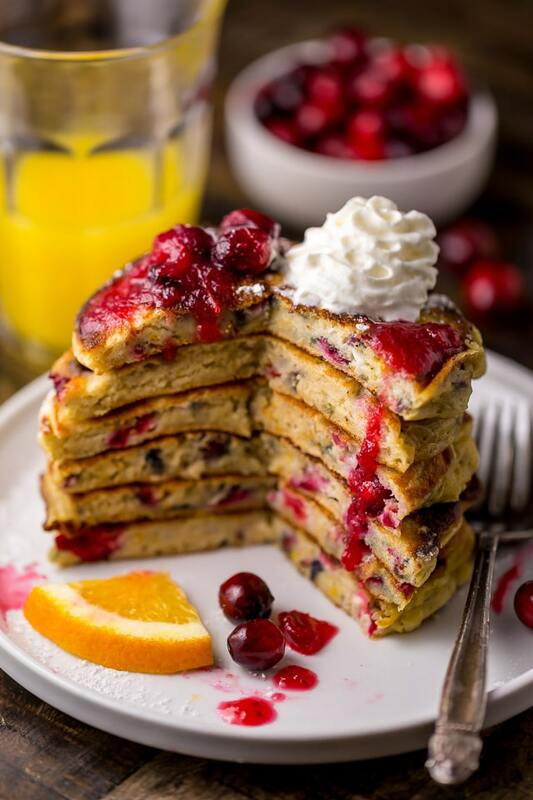 If you try this recipe for Cranberry Orange Pancakes, let me know what you think! Leave a comment below, and don’t forget to snap a pic and tag it #bakerbynature on instagram! Seeing your creations makes my day. 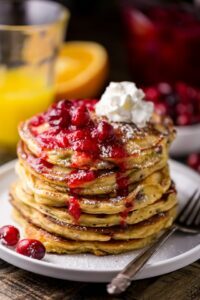 Fluffy and flavorful Cranberry Orange Pancakes are covered in Cranberry Maple Syrup! In a large mixing bowl, add the flour, sugar, baking soda, baking powder, salt, and cinnamon; whisk well to combine. Add in the chopped cranberries and, using a rubber spatula, mix until they're coated in the dry ingredients. Set aside until needed. In a separate large mixing bowl, add the eggs and lightly beat them with a whisk until the yolks and whites are evenly combined. Add in the milk, ricotta cheese, and vanilla and beat until well combined. Using a rubber spatula, fold the wet ingredients into the dry ingredients, stirring just until everything is combined. Quickly fold in the orange juice and zest, stirring until evenly combined. Be careful not to over mix the batter. Pour batter by 1/3 cupfuls onto a greased hot pan or griddle, adding only a few at a time so that they do not blend together. Cook for about 2 minutes before flipping them over, or until small bubbles form on top. Cook on the second side until golden brown, about 1-2 minutes. Repeat with all pancake batter. 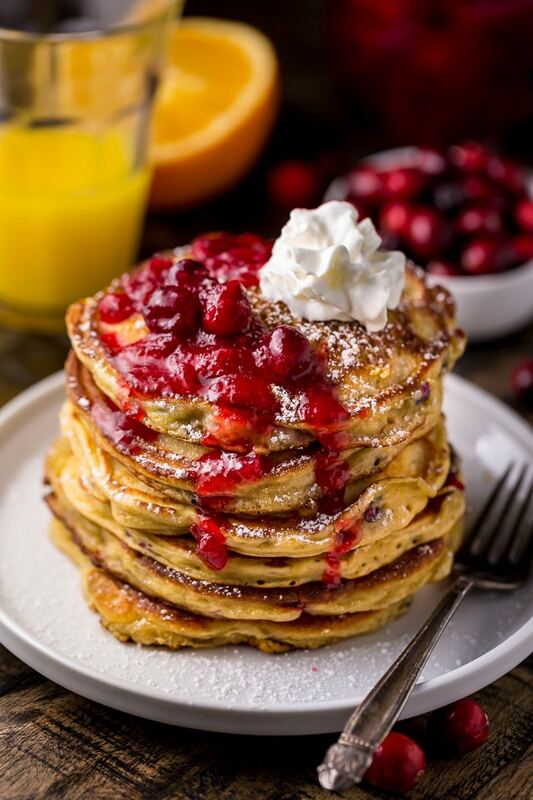 Serve pancakes warm, with cranberry maple syrup, plain maple syrup, or whipped cream. In a small saucepan, bring the cranberries, orange juice and sugar to a boil. 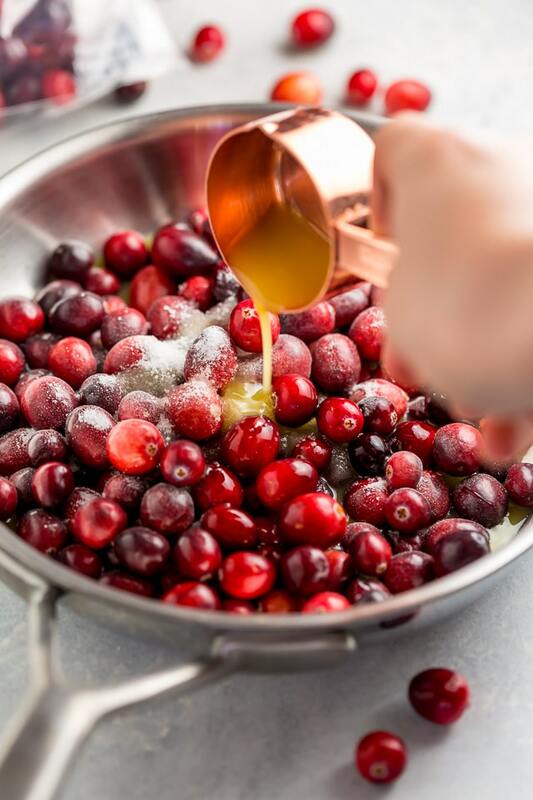 Reduce the heat and simmer, uncovered, for 5 to 6 minutes, or until they cranberries have softened and can easily be smashed with the back of a spoon. Remove from heat and stir in the maple syrup and butter. Spoon the mixture on top of the pancakes and serve at once. To freeze: place cooled pancakes between layers of waxed paper, then place them in a freezer-safe plastic bag, squeezing out any excess air before sealing the bag and placing it in the freezer. Pancakes will keep in the freezer for 2 months. To reheat: heat your oven to 375 degrees (F). Place the pancakes in a single layer on a large baking pan; cover with tinfoil and heat in a preheated oven for 6-8 minutes, or until warm. You may also microwave 3-4 pancakes at a time for about 40 seconds, or until heated through. Wow, great and eye catchy Food photo. I like it.